Piece of a slab of white marble broken in two ( 72 x 39 x 17 cm; letter height: 1.4-1.6 cm). Found at Nedvigovka in 1869-70. Now in Hermitage (inv. TH 312).
. . . The synod (?) of those gathered around (?) . . . Hegesippos son of Menestratos the priest, Theagenes son of Kasandros the synagogue-leader (synagōgos), Sasas son of Sasas the goodness-loving official (philagathon), and Domnos son of Seleukos the assistant to the goodness-loving official (paraphilagathos) set this up. 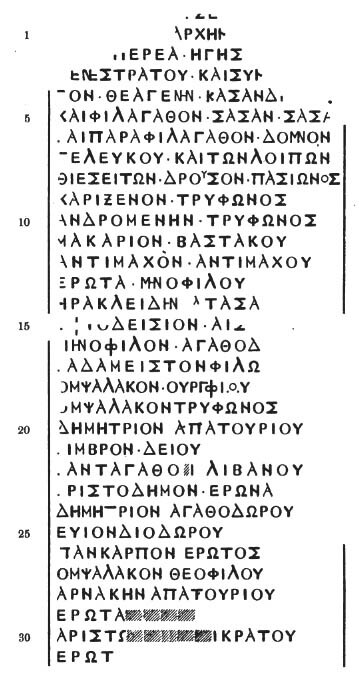 The rest of the society-members (thiasitai) are: Drusus son of Pasion, Charixenos son of Tryphon, Andromenes son of Tryphon, Makarios son of Bastakos, Antimachos son of Antimachos, Erotas son of Menophilos, Herakleides son of Atasas, Aphrodeisios son of Aischinos, Menophilos son of Agathodoros, Rhadameistos son of Philon, Ompsalakos son of Ourgios, Ompsalakos son of Tryphon, Demetrios son of Apatourios, Kimbron son of Deios, Pantagathos son of Libanus, Aristodemos son of Eron, Demetrios son of Agathodoros, Euion son of Diodoros, Pankarpos son of Eron, Ompsalakos son of Theophilos, Arnakes son of Apatourios, Erotas son of . . . Name, Ariston son of . . . Name, Erotas son of . . . Name, Styranos (?). . . (remainder missing). IBosp 1262: Facsimile by Latyšev (IPontEux II 443).